I always thought it was strange that I got an ice cream cake for my birthday. I wasn’t a big fan of ice cream. And, my birthday is dead in the middle of the coldest part of the Northeast Ohio winter. I kind of imagine it started with my pleas. I must have had ice cream cake at some warm sunny summer party and then begged my mother for the cake through the dog days of summer. My mom must have held onto my desire, waiting patiently, until she could make good. This was the tradition my mother had chosen for me. I probably could have stopped this train, but why? Then there was the tradition I chose. When I became school age, I learned of the expression “birthday treat.” Girls were allowed to bring their favorite dessert on their birthday. (It’s not as if boys were fed bread and water—it was a girl’s school.) Most of these mothers stayed home, or worked in a more social sense. So, the desserts were handmade. There were cupcakes with tiny pink flowers, brownies with nuts, and even baklava. With my birthday almost halfway through the school year, I had taken a mental tally of what would be the most prized dessert. These were the sorts of things upon which first grade reputations are made. It needed to have mass appeal. Chocolate was in order—obviously. But, chocolate cupcakes could be so, well, simple. There needed to be more. I wouldn’t say nuts. That was the sort of thing that divides an audience. There are those for whom the nuts are a welcome surprise, and then there are the other half who feel put out to have their teeth accosted by the change in texture. And, I wouldn’t say anything with fruit. Noone, I mean no one, brought fruit desserts for their birthday—they had the vague ring of nutritional soundness. Really the goal was to up the sugar content of the dessert. In the end, I went with chocolate cupcakes filled with marshmallow fluff and topped with chocolate frosting. I can still taste those cupcakes after all these years. If you asked me tastes like my birthday, what was my birthday tradition, well, I can almost hear the clink of the butter knife against the empty glass jar of fluff. So, this week with Tigerlily’s birthday, I have been thinking what will be her tradition? 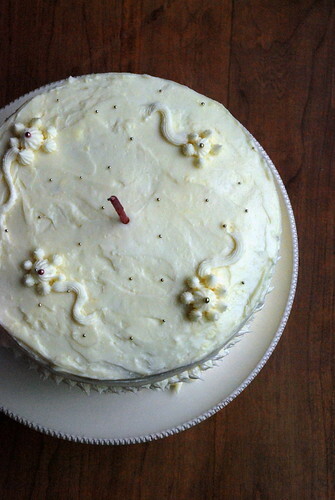 Born in the dead heat of the summer, with fruit at its best, I decided to make a sort of Hummingbird cake. I used roasted banana, peaches and mangos—all oven-roasted until their skins blackened. Mango is delicious in all forms, but roasting them in the oven, turns them into a rich jam. Tiger loves mango. She storms around mouth open clucking loudly like an irate chick when she sees you cutting into one. It seemed a fitting choice; a good way to start a tradition. If fifteen years from now, we have Humminbird cake, and she asks me why, will I remember this? Who knows? She will probably say to her from friends, I have no idea why my crazy mom makes this cake. So, next year at this time, will I be slicing into six layers of heaven again? Considering the scores of January ice cream cakes I have eaten, maybe. Peel the fruit, deseed peaches and bananas, and combine in a blender. Should make about 4 cups fruit pulp. The combination should be mostly mango, so pick your fruit accordingly, or add aam ras/ mango pulp if necessary. Pour the mixture into two 9-inch round springform pans lined with parchment paper and then greased and floured. Bake the cakes for 1 hr at 350. This time pour the batter into 3 pans. Bake the cakes for 1 hr at 350. Cool the cakes for 2 hours. Then cut each layer in half. Frost each middle layer. You will use ½ of the frosting for the interiors, and ½ for the exterior. Chill after the crumb coat and then finish with the decorations. I am submitting this to Weekend Herb Blogging with Mango as the highlighted ingredient. I came to cooked mango later in life. As a kid I thought it was criminal to mess with the firm sweetness. But, I really appreciate the complicated flavor of cooking or even roasting mango. We always had strawberry shortcake as the birthday tradition in my house. And I have no idea why. I like the idea of a tradition though...even if you don't always remember how or why it started. 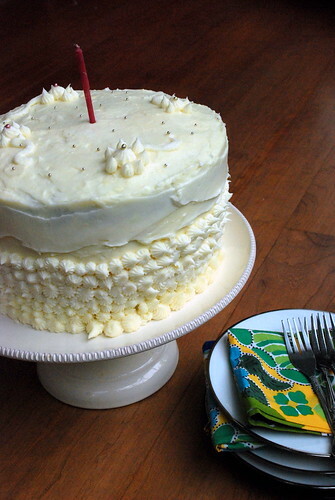 The mango in this hummingbird cake sounds divine and it truly looks gorgeous! Wow. I thought I did a lot of baking this weekend, but this is a lot of baking for one cake, but I'm sure it's worth it. I never thought of doing so many fruits in one cake. It must have been delicious. happy birthday to tiger - love the cake - a layer cake is what I think of for birthdays - though I would have been impressed if you had started with one layer and added one for each birthday - would have loved to see it by the time she got to 10 - ha ha ha! That's a grand cake! The roasted fruit sounds amazing. I hope you do keep the tradition, at least for a few more years! What a gorgeous cake! I think it would be a lovely tradition. It seems so feminine...and girly. Not to mention insanely delicious! 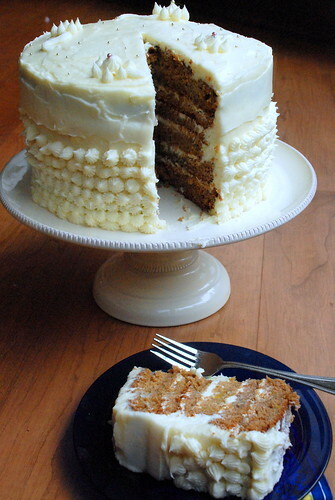 Wow - I absolutely adore hummingbird cake and this is an inspired combination. I can't wait to try it out! Lovely tall cake! And I like the idea of roasting the mangoes, I haven't done that one yet.